I've not been paying close attention to monetary policy this year - I felt that arguments about the pros and cons of interest rate rises had been done to death, so when the MPC raised to 0.5% in November it barely registered. But with uncertainty surrounding Brexit likely to dominate macro policy over the next year, I wanted to present an overview of the monetary foundations. CPI has recently gone above the 3% letter writing threshold, and it's trajectory is a concern. The RPI tells a similar story, although the CPIH seems to show that the main inflation pressures might have already passed through. The December Inflation Attitudes Survey has revealed an uptick in inflation expectations, with the median response for 5 years time reaching 3.5%. It will be important to monitor whether policy decisions curtail this view. However other key indicators suggest policy may be too tight. 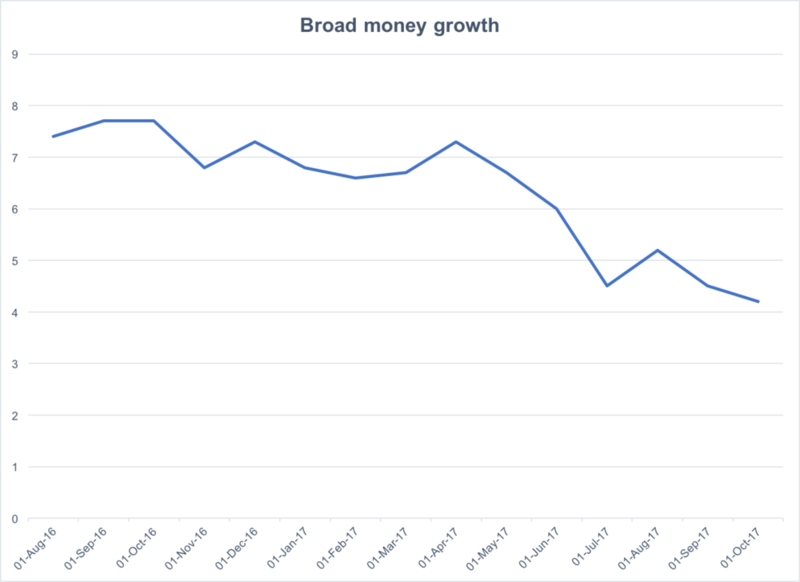 As the chart above shows broad money (M4ex) growth has steadily fallen since last summer, and current growth of 4.2% is probably too low. Divisia measures have fallen from 12.5% this time last year, to 9.8% now. Industrial production was at 3.5% in October, stronger than the US but weaker than the Euro area. NGDP growth is currently 3.4%, suggesting that the back end of 2016 wasn't a return to consistent ~4% growth but more of a blip. This is a big concern and if it falls below 3 the Bank of England should take note. So what's the implication for interest rates? My rough estimate of the natural rate is currently 2.1%, whilst a classic Taylor rule suggests rates should be 4.6%. So policy rates still feel artificially low. But if inflation is passing through, and AD continues to fall, choppy waters may lie ahead.